H.O.S.H. 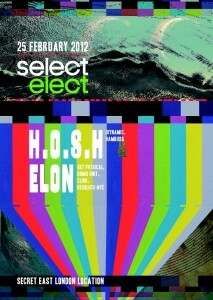 & ELON are two heavy weights of the electronic music world scene, who have gravited far from London in the last year: on the 25th of this month Select*Elect will bring them back, to take over the big LDN’s dancefloor. The date is set, the place not yet to be known, the further step on the path of quality underground dance music done. H.O.S.H is the elder brother of the Diynamic dinasty, a musical collective from Hamburg. He’s a 24/7 dj, promoter and producer, who honours the art of mixing by pushing it to the highest terms in front of enthusiastic crowds such as those of Watergate Berlin, Studio 80 in Amsterdam or Ego in Amburg. When he’s not on stage H.O.S.H. Promotes and organizes The Gru_nanlage Festivals a series of electronic dance marathons held for free in northern Germany every summer. Elon is a guy fueled by a deep passion for the freshest underground techno sounds. He’s a three in a one man show: a dj, producer and nightlife visionary who strongly influenced NYC electronic music scene. Resident dj for the Resolute Collective, active member of Clink Recordings and Dumb-Unit posse. Elon’s work is surrounded by hype, everybody says he’s rocking great, a real pro dj and producer as Jeremy P. Caulfield and Maceo Plex aka Maetrik can confirm after having collaborating with him. 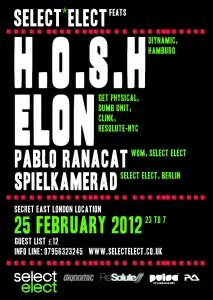 Select*Elect HQ have given us 3 spaces on the free guestlist to give away! All you need to do is answer this question: What’s the real name of H.O.S.H ?